HomeBlogCan You Floss While Wearing Braces? Can You Floss While Wearing Braces? Maintaining good oral hygiene practices is important for all of us and our overall health. It is just as important to keep up good oral hygiene habits when undergoing any orthodontic treatment. It is best to not neglect your oral hygiene routine whilst wearing braces as it can possibly lead to prolonged treatment, discoloration, white spots (tooth decalcification), cavities as well as gum disease. Along with brushing, flossing plays a key role in relation to maintaining a good oral health status. Even though it can be a bit difficult to floss whilst wearing braces, you should still get into a routine of doing it. You can use super floss (floss threader) or a water flosser to ensure that the space between each tooth is being taken care of and cleaned properly. Especially, in the places that are hard to clean, such as in between the brackets and wires. It is recommended to floss once a day while wearing braces. It is also vital to continue flossing after you are done with your orthodontic treatment. Additionally, you can use a small interdental brush to clean around your orthodontic appliance. Brushing your teeth will not remove all of the plaque. Therefore, you need to floss to get rid of the plaque as your toothbrush will not be able to reach all of it. 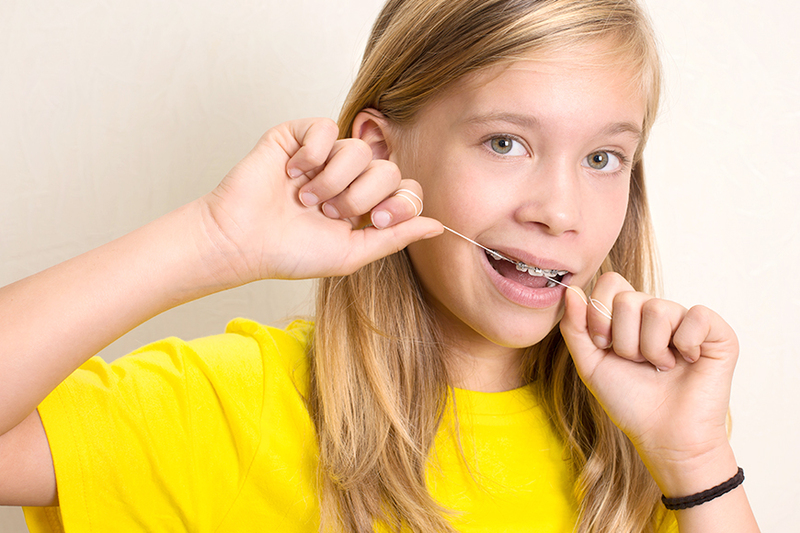 You can use a floss threader, which will help you pull the floss behind the wire of your braces. If you opt for this method, you will save a lot of time and still be able to maintain a good dental care routine. Alternatively, you can use a water flosser. This is an oral health appliance that is designed for your oral care at home. The water flosser has a motor and pump that create a stream of pressurized water to flow through the orthodontic tip which helps clean the areas in between your teeth. This will also help improve your gum health. Lastly, arrange to have regular dental cleaning sessions with your dentist or dental hygienist to ensure that your teeth and gums are healthy throughout your orthodontic treatment process. I am not sure where you are getting your information, but good topic. I need to spend some time learning much more or understanding more. Thanks for great info I was looking for this information for my mission.